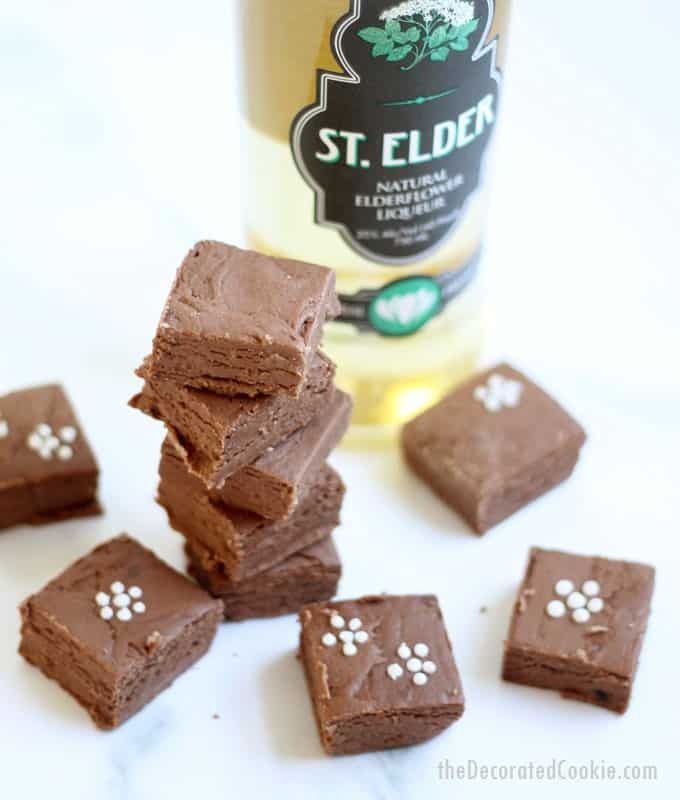 Next up in my 3-ingredient BOOZY FUDGE series: Elderflower liquor! Rum, gin, vodka, Schnapps, Bailey’s, tequila… So many liquors, so little time. I saw this elderflower liquor in the store and had to give it a go. 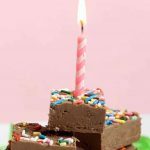 What is boozy fudge? 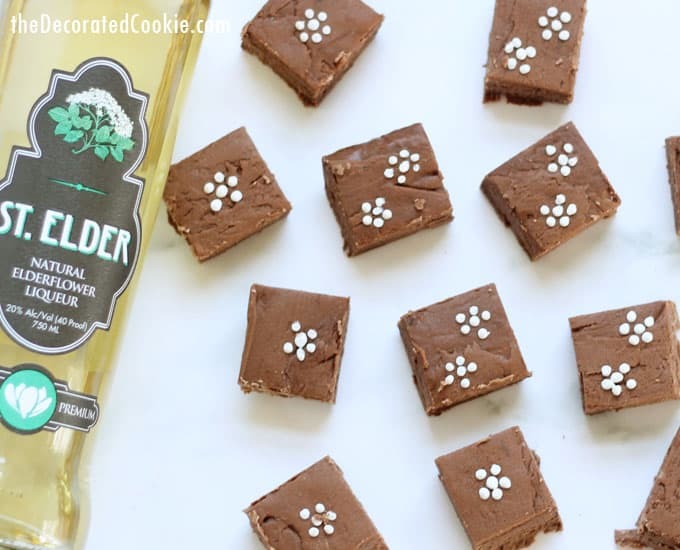 Boozy fudge is the world’s most perfect food (for lazy drinkers). 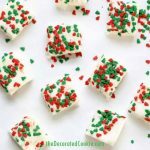 It’s only three-ingredients–confectioner’s sugar, chocolate, and booze–and takes minutes to make. 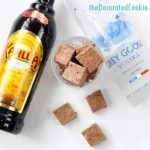 Mix and match the booze and kind of chocolate. Add some toppings if you like. But most importantly, it’s STRONG. It tastes of booze. 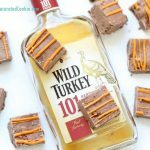 So if you don’t like booze, I don’t suggest making this fudge. I liked the elderflower liquor and chocolate combination. For a little something extra I used royal icing to pipe little flowers (the elderflower is a small, white flower) on a few of the pieces. This is optional, of course. 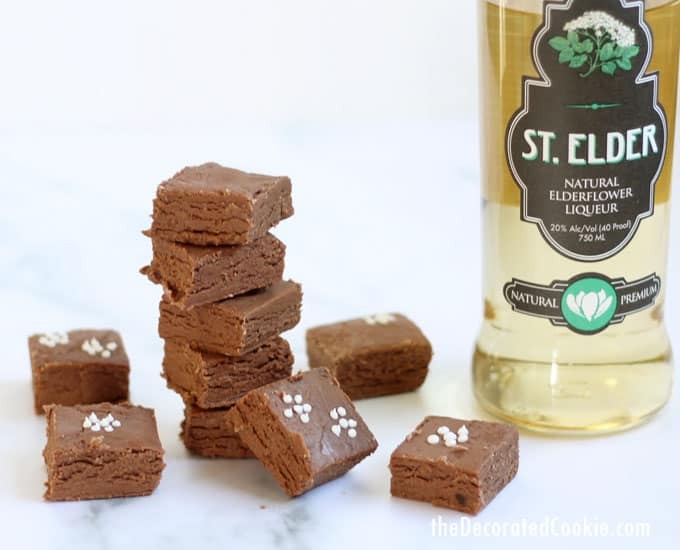 I do advice labeling the fudge, though, so folks know the kind of liquor in the dessert and so kids or those who can’t consume alcohol don’t accidentally eat a piece. 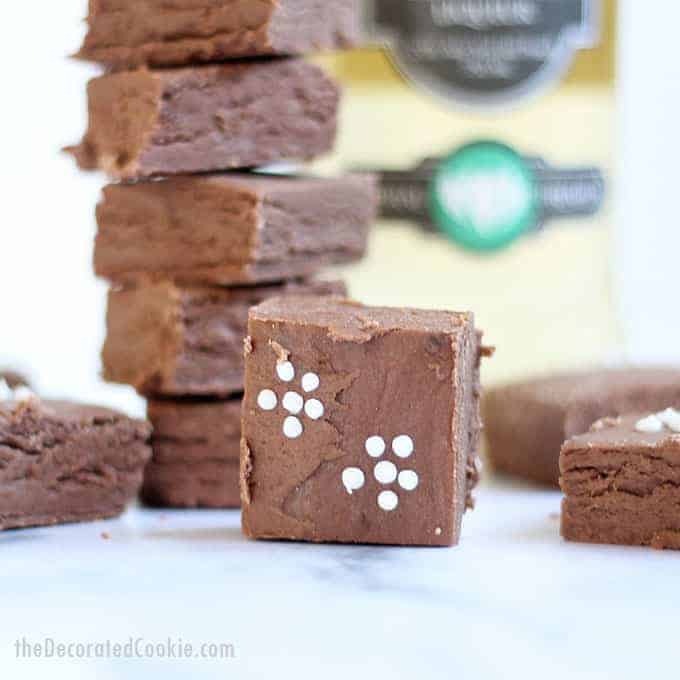 So, let’s make some boozy fudge! *Here, I filled a disposable decorating bag with royal icing tinted with white food coloring. I used a size 2 tip. While the chocolate is melting, place the confectioner’s sugar in a large bowl. Whisk the liquor into the sugar. The mixture will look like icing. When the chocolate is melted, quickly pour the chocolate into the sugar and liquor mixture and stir very well. Scrape the chocolate, liquor and sugar mixture into the prepared baking pan. Spread evenly. Let set at room temperature or in the refrigerator at least an hour. Cut into squares. If desired, pipe flowers on top of the fudge.